Explorer 12 is a ship carrying a multinational crew. Their mission: Explore Uranus for alien life. On the way, they experience a strange loss of time. They awake on the surface of Uranus and discover not only a small village in an air tight dome, but several women as well. These elements all seem drawn from the crew’s thoughts, but they are solid and real. Something waits from them outside the dome, something that wants to conquer the Earth. 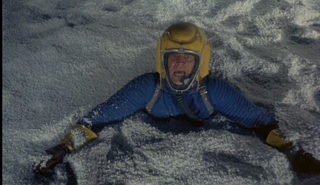 Journey to the Seventh Planet is garish and often gross. It shares the creative team of Ib Melchior and Sidney Pink from Angry Red Planet (1959), and it’s easy to see it as an quasi-sequel of that film. When the astronauts arrive on Uranus they discover no horrible monsters (at first) but instead the women of their dreams. This makes the story trade less on menace and more on mystery. The astronauts are all broad characters defined more by their nationality than actual personality traits. The female characters are nothing more than cyphers to resolve. It makes it difficult to invest in the drama of situation, but really, you’re here for the monsters, so I don’t see it as a big loss. At its heart the movie knows that too, and starts delivering the space horror soon enough. The monsters consist of a one-eyed dinosaur, a very big (space) tarantula, and a murderous alien brain. The effects are crude even by 1962 standards, but they also have a psychedelic edge to them. This is especially noticeable in the alien brain that throws out colorful patters and swirls of light in an attempt to telepathically dominate the crew. Astronauts, aliens, and space temptresses; all of this had been done to death by 1962. What makes Journey to the Seventh Planet stand out from the pack is its quirks. One of the most noticeable is how everyone in the movie takes great pains to pronounce Uranus as Ur-ahn-us, probably to heading off tittering school children but depriving the film of quotes that could have been sampled endlessly in the future. 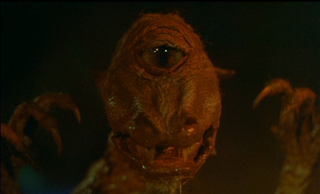 The film also features a love theme that would sound more at home in a cocktail lounge than closing out a movie that features smooshy space monsters. The monsters themselves are colorful and strange. The one-eye rat-dinosaur and the killer space brain are fun creations, and I wish the movie would have found room to have a few more bizarre monsters. Yeah, yeah... Uranus, space ladies, one-eyed monsters... I get it, movie. Thanks. The acting is reasonably good for such paper thin characters. John Agar is the most familiar face here, having played dozens of square-jawed American heroes. Here he is no different, but he’s very comfortable in the role. Carl Ottosen and Ann Smyrner approach something resembling on screen chemistry as Commander Eric and Ingrid, even ending on a note that would be melancholy if what came before in the movie wasn’t so goofy. 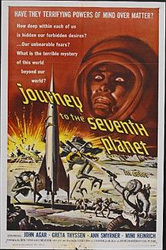 Journey to the Seventh Planet is cheap looking but vibrant. There is definitely an effort to give it more depth than you would expect in a space monster adventure. It’s just weird enough around the edges to make it a memorable entry in b-movie science-fiction.